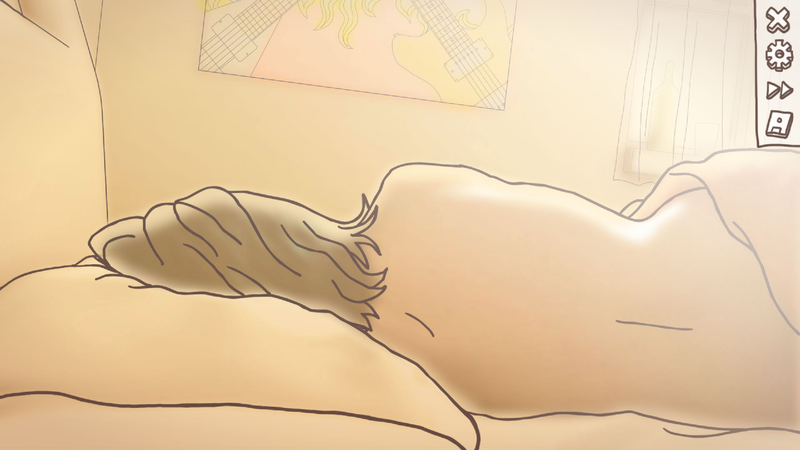 One Night Stand is a game about, well, a one night stand. In this game you wake up naked in a stranger’s bed and try to piece together how it happened. While the scenario can play out in 12 different ways, the story as a whole is a gentle look at how two people can come together, and what happens from there. In real life, one night stands are usually kinda weird and unfun, especially after someone has to go home. One Night Stand is strongest when its expressing that awkwardness. The man you play as doesn’t remember his lover’s name, or much from the night before. The game takes place in a single room. You’re tasked with figuring out how he got there from the smattering of objects within it and inevitably you’ll reveal how ignorant you are of your circumstances. After the woman realizes just how drunk he had been, she’ll blurt out, “This is humiliating.” I felt a little bad, sitting there impotently, wanting to figure out which option would comfort her and not knowing how. While there are elements of an adventure game here, playing it like one tends to make your character come off as invasive and creepy. Throughout the room you can click on items to try to piece together who this woman is. In my playthrough, I called her by the wrong name and she kicked me out for it. Still, there’s opportunities for tenderness here. The writing paints a picture of someone who is a bit of an idealist about dating and romance. The vulnerability of the situation, you sitting naked on her bed while she stands in front of you in a camisole and underwear, makes the small interactions within One Night Stand compelling. The naturalistic animation only serves to further express the game’s humanity. The motions are fluid, sometimes in a startling way, like when she reaches out to hand you a cup of coffee. Nothing is cartoonish or over the top—this is just a story of two people trying to figure each other out. The screen is bathed in the pale pinks and oranges of a sunrise and it feels intimate and human. One Night Stand is a small, polished slice of what feels like a real human interaction, but the number of endings almost undercut it. It feels shallow to reach what feels like a realistic end point and then have the game remind you that there’s other ways to have this play out. Still, One Night Stand is refreshing in its simplicity. There’s no grand conspiracy or life changing revelations. This is just a game about two people trying to understand each other.